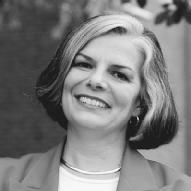 Julie Gerberding is a physician and an expert in infectious diseases. As director of the Centers for Disease Control and Prevention (CDC), she also holds what may be the most important medical job in the United States since the CDC is the federal agency in charge of protecting the health and safety of the American public. That task has been a challenge since Gerberding took on the job of director in July of 2002. Before she could settle into her position, she was confronted with the mysterious viral infection known as severe acute respiratory syndrome (SARS). That epidemic was followed by an outbreak of the rare monkeypox virus, and an especially widespread threat of the West Nile virus. In addition, as head of the CDC, it is up to Gerberding to make sure that the American health system is prepared to handle a bioterrorist strike, a very real threat since the attacks of September 11, 2001. Gerberding, the first woman to hold the post of CDC director, remains undaunted. In 2004 she announced a massive reorganization and vowed in Time magazine that she is "redefining [the] CDC as the nation's health-protection agency." Julie Louise Gerberding was born on August 22, 1955, in Estelline, a tiny rural town in South Dakota, where her father was the police chief and her mother was a schoolteacher. Gerberding knew from the very beginning that she wanted to be a doctor. In fact, she built her first laboratory to study the life cycle of bugs in her parents' basement. After high school, Gerberding moved to Cleveland, Ohio, to attend Case Western Reserve University. While an undergraduate she received the school's top science prizes, and in 1977, she earned a bachelor's degree in chemistry and biology, graduating with honors. After some consideration, Gerberding decided to stay at Case to pursue her medical degree. She graduated in 1981, again with high honors. Gerberding also took home Case Western's Alice Paige Cleveland Prize, which is awarded to a woman graduate who displays outstanding leadership qualities. "There is no time to lose. Our waistlines are expanding while our health is deteriorating." Gerberding headed to the West Coast to complete her internship and residency training at the University of California, San Francisco (UCSF). This was in the early 1980s, and San Francisco was being hit hard by an unknown disease; as a result, the young physician became involved in the early battle against acquired immunodeficiency syndrome (AIDS). As Gerberding explained in a 2003 CWRU interview, "My clinical training really evolved with the AIDS epidemic and it was natural for me to get started in the infectious disease area during that time." She completed a fellowship in pharmacology (the study of drugs and their effects) and infectious diseases, and in 1990 was named director of UCSF's Epidemiology Prevention and Interventions (EPI) Center. Epidemiology is the area of medicine that deals with the control and transmission of disease. Gerberding and her colleagues at the EPI were instrumental in creating guidelines to help prevent the transmission of AIDS to healthcare workers. They also developed a medical procedure to combat infection in workers who had been exposed through needles. In addition, the EPI became an information center for businesses about how to deal with people infected with HIV in the workplace. Gerberding quickly became known in the medical community as an authority on AIDS and she continues to be a leading advocate to this day at the CDC. As she commented to Lois Bowers of CWRU: "AIDS is the number one health problem affecting most of the developing world as well as the developed world. It is an agency priority that we do our share of interventions to prevent its spread." The issue of obesity is not a uniquely American one. In 2004 the World Health Organization estimated that over one billion adults worldwide were overweight, which put them at risk of such diseases as diabetes, cancer, and heart attack. In May of 2004, Julie Gerberding represented the CDC at an international conference in Geneva, Switzerland. The United States, along with 194 other countries, met to approve the Global Strategy on Diet, Physical Activity and Health, which recommends that people change their diets and habits by exercising more and limiting their intake of fat, salt, and sugar. At home, the CDC put the recommendation into action by launching a $190 million national multicultural campaign called VERB: It's What You Do. According to the program's Web site, the goal is to help preteens and teens get active in a "cool and meaningful way." CDC statistics point to the fact that 30 percent of children watch at least five hours of television a day. VERB offers tools and tips for parents to help get the family off the couch and on the go. One idea is for families to explore sports from other countries. For example, broomball, which originated in Canada in the 1900s, is similar to hockey; it is played on ice, but instead of hockey pucks and sticks, players use brooms and balls. At the Web site there are quizzes, polls, and incentives to track activity hours, like a chance to win sports gear from the Women's National Basketball Association (WNBA). There are also activity suggestions for almost every day of the year, including a Bike to School Day or have a race with Mom on Mother's Day. In 1998 Gerberding went to work for the Centers for Disease Control and Prevention (CDC), a federal agency that is part of the Department of Health and Human Services. Established in 1946, the mission of the CDC, as stated on its Web site, is "to promote health and quality of life by preventing and controlling disease, injury, and disability." The agency carries out this mission by partnering with other groups both in the United States and abroad to, according to the CDC Web site, "detect and investigate health problems; conduct research to enhance prevention; develop and advocate sound public health policies; implement prevention strategies; promote healthy behaviors; foster safe and healthful environments; and provide leadership and training." Over eight thousand people are employed by the CDC, which is based in Atlanta, Georgia. The CDC is composed of twelve operational units, or offices, including the National Center for Environmental Health and the National Center for Infectious Diseases (NCID). When Gerberding joined the CDC, she became the director of the Division of Healthcare Quality Promotion, which is part of the NCID. She used her expertise to further research into the area of hospital safety, and focused specifically on investigating medical errors and drug-resistant infections. Just three years later, in 2001, Gerberding was appointed acting director of the NCID. Almost immediately she was faced with a national emergency. Just one month after the terrorist attacks of September 11, 2001, there were several reports of anthrax, a potentially fatal disease of the lungs, in Florida and Washington, D.C. Experts suspected foul play since anthrax is usually transmitted to humans by contaminated animals. The NCID instantly went to work, and together with other federal agencies and local health organizations, discovered letters containing anthrax spores in District of Columbia postal facilities and various news organizations. A widespread panic spread across the country, and people became wary of opening their mail. 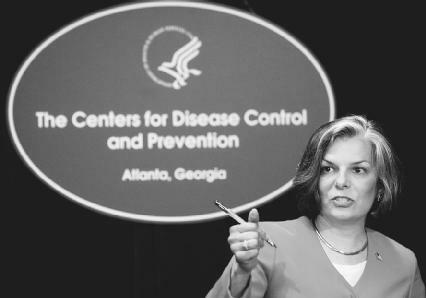 Dr. Julie Gerberding, director of the CDC, speaks during a 2003 press conference on Severe Acute Respiratory Syndrome (SARS). and capacity every day to assure that CDC and our partners are ready to respond to any terrorist event." In spring of 2002, when CDC director Jeffrey Koplan announced that he was stepping down, it came as no surprise that Gerberding was being considered for the job. Tommy Thompson (1941–), the Secretary of Health and Human Services, especially championed her appointment, and when the official call came through in July, it was Thompson who spoke to the press. "I can think of no one better equipped to take the helm," he said, as quoted on CNN.com. "[Gerberding] brings the right mix of professional experience and leadership skills to ensure the CDC continues to meet the nation's public health needs." Barely six months in the director's chair, Gerberding's skills were put to the test when the United States once again faced a mysterious illness. This time it was labeled severe acute respiratory syndrome, or SARS. Although the disease originated in Asia, with China hit particularly hard, it soon became apparent that this was a disease that traveled. By May of 2003, there were almost seven thousand cases reported in almost thirty countries. Although only approximately sixty of the cases appeared in the United States, people were frightened because the flu-like disease was potentially fatal. Gerberding and the CDC worked quickly to join with international researchers in understanding what caused the virus and how it was spread. And, again, Julie Gerberding was the voice of reason for the American public. Throughout 2003, Gerberding appeared regularly in the press, providing statistical updates and fielding countless questions. She answered honestly and clearly, explaining that the disease was spread through face-to-face contact, specifically through droplets spread by a cough or sneeze. She admitted that it was a sobering situation, but she also warned that it was difficult to separate the "help from the hype." In a press conference on April 14, 2003, she offered some simple precautionary steps: "My advice is to kind of follow the same rules that your mother taught you in kindergarten. Keep your hands clean, and cover your mouth with a tissue if you're coughing and sneezing. And use common sense." Just as the press over SARS started to die down, other national health concerns dominated the headlines during the summer of 2003, including a rare outbreak of monkeypox in the Midwest and a return of the West Nile virus. The monkeypox virus is usually isolated to Africa, but in June there were more than sixty cases reported in the United States. The CDC was called in and quickly linked the infection to prairie dogs, intended for sale as pets, which had been bitten by an infected African rat. As a result the CDC launched an investigation into the exotic pet trade. An ongoing issue was the West Nile virus, a disease that is spread primarily through mosquito bites. Because of heavy rainfall in the Eastern United States, there was a rash of cases. According to CDC reports, in 2003 West Nile infected 9,862 Americans, 264 of whom died. Although rare diseases and bioterrorism tended to grab the spotlight, Gerberding stressed that the CDC remained committed to public health concerns that are ongoing. As she noted to Lois Bowers of CWRU, "The CDC ... exists to promote safe, healthier people in all communities, and those priorities have not changed at all since 9/11." In 2003 the agency's annual budget increased to $7.2 billion. This would allow the CDC to focus its energies on such chronic issues as diabetes, asthma, and obesity. In 2004 the agency paid particular attention to the issue of weight control. According to CDC statistics cited by Kim Severson of the San Francisco Chronicle, "deaths related to poor diet and too little exercise have increased by 33 percent over the last decade." The agency predicted that if the trend continued, being overweight and out of shape would soon become the numberone cause of preventable death in the United States. In 2004 Gerberding was also committed to restructuring the CDC, which she claimed was like a jigsaw puzzle when she first came on board. In an effort to streamline processes, the number of directors reporting to Gerberding was reduced from twenty-five to thirteen and the various units were grouped under four centers. On May 13, 2004, Gerberding announced that the agency would focus on two major health protection goals: Preparedness, which will ensure that each person in every community is protected from infectious, environmental, and terrorist threats; and Health Promotion and Prevention of Disease, Injury, and Disability, with a special focus on improving the quality of health at "every stage of life." Gerberding acknowledged that the CDC was an "extraordinary agency with the greatest workforce in the world," but she also observed that "today's world characterized by tremendous globalization, connectivity, and speed poses entirely new challenges. The steps we are taking through this initiative will better position us to meet these challenges head on." With Gerberding at the helm, the CDC should be able to meet almost any challenge. A dedicated caregiver, a natural leader, and a gifted researcher, she is active on many fronts outside of the agency despite her often grueling schedule. In addition to being a wife and mother, Gerberding is an associate professor of medicine at Emory University in Atlanta, and belongs to a number of professional organizations, including the American Society for Clinical Investigation. She also serves as an adviser to several health organizations, one of which is the newly formed Grand Challenges in Global Health Initiative. The goal of the organization, which is composed of experts in a variety of health fields, is to come up with the key issues that need to be addressed in order to effect change at a global level. Gerberding, still sounding like the young doctor who was a pioneer in the 1980s, told CWRU, "We're going to be thinking out of the box, we're going to be thinking big, and we're going to be thinking, 'What can we do that will have the most impact?'" Bowers, Lois A. "The Front Line: Julie Gerberding." CWRU Magazine (spring 2003): pp. 29–31. Park, Alice. "Julie Gerberding: The Health-Crisis Manager." Time (April 26, 2004): p. 102. Severson, Kim. "Weighty Crusade: Worldwide Efforts Promote Healthier Diets, More Exercise." San Francisco Chronicle (May 23, 2004): p. A1. "As Americans Reflect on 9/11, HHS and CDC Continue to Aggressively Prepare the Nation for Another Terrorist Attack." Centers for Disease Control and Prevention, Office of Communication. (September 9, 2002). http://www.cdc.gov/od/oc/media/pressrel/r020909.htm (accessed August 1, 2004). "CDC Announces New Goals and Organizational Design." Centers for Disease Control and Prevention, Office of Communication (May 13, 2004). http://www.cdc.gov/od/oc/media/pressrel/r040513.htm (accessed August 1, 2004). "CDC Chief on Public Health's Front Line." CNN.com: World News (April 19, 2004). http://www.cnn.com/2004/WORLD/americas/04/16/gerberding (accessed August 1, 2004). Centers for Disease Control and Prevention Web site. http://www.cdc.gov (accessed August 1, 2004). "SARS: Genetic Sequencing of Coronavirus." Centers for Disease Control and Prevention, Office of Communication (April 14, 2003). http://www.cdc.gov/od/oc/media/transcripts/t030414.htm (accessed August 1, 2004). VERB Now.com! Centers for Disease Control and Prevention. http://www.verbnow.com (accessed August 1, 2004). "WHO's Anti-Obesity Plan Wins Backing from U.S., Food Industry." Bloomberg.com: News & Commentary (May 20, 2004). http://quote.bloomberg.com/apps/news?pid=10000103&sid=aAmoQey1ZIBc&refer=us (accessed August 1, 2004).